After Miss A’s visit and quilting on Monday morning, I had my normal Monday chores to get out of the way in the afternoon. Boy is grocery shopping at 8am much more pleasant than 2pm. But I digress. 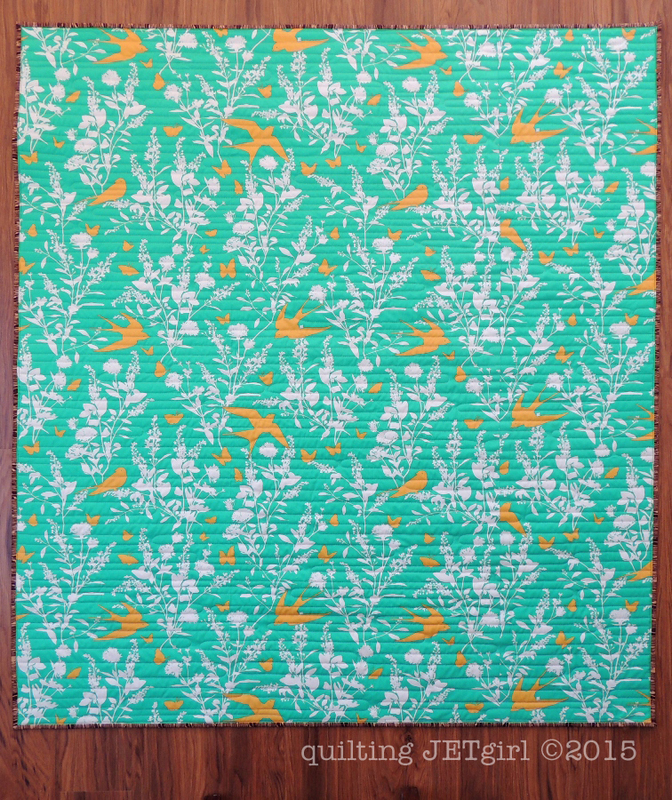 I was able to get the bird quilt loaded on my long arm Monday afternoon, and after puzzling over how to quilt it the rest of the evening, I was ready to work on it first thing Tuesday morning. 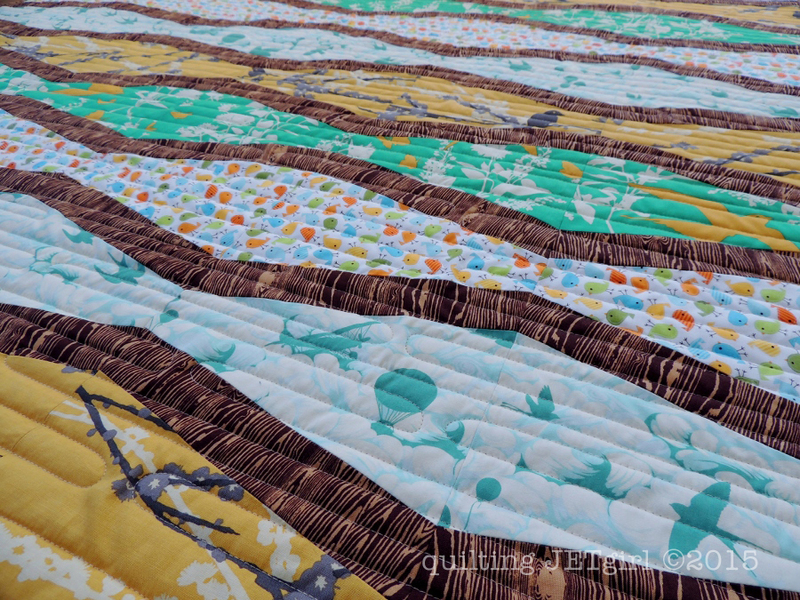 I chose to use an allover quilting design of a wide back and forth line using 50wt Aurifil 2312 (Ermine), which is a light khaki color that ended up blending in with all the fabrics of the quilt top beautifully. This is one of those quilts that I liked more with each step. The quilting is loose and left a great soft and cuddly texture, and I really like how the binding frames out the quilt. And I just love the backing for the quilt. 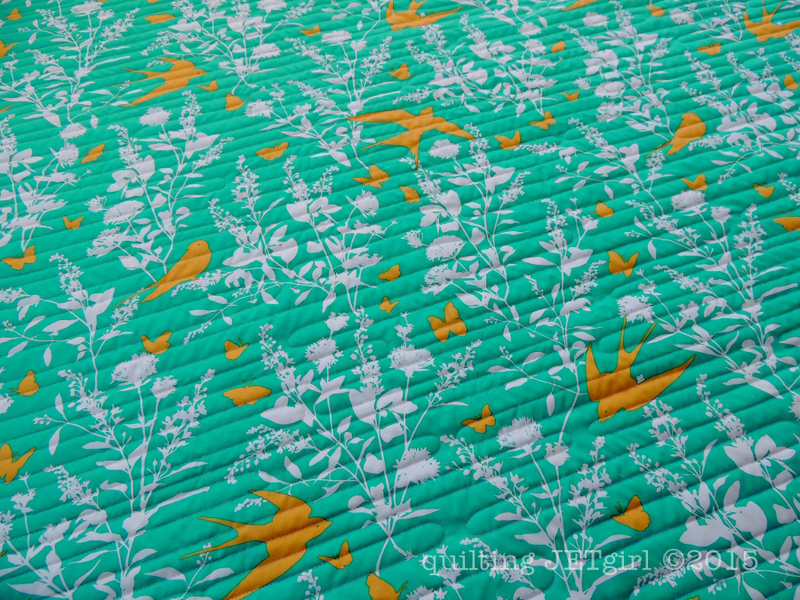 I did not have enough of the print to match the seam, but I love getting to see the large scale swallow print in all its beauty across the quilt back. All together, I spent 8 hours and 10 minutes making this quilt. I made the lap size version of Elizabeth Hartman’s New Wave pattern. How amazing. I love how the birds look like they are sitting on branches. Beautiful! 8 hours hmmmm it would take me that long just to put the top together and maybe get it ready for quilting. Well done it is a gorgeous quilt. You put this quilt together very quickly, it was just Sunday that you were showing the fabric, wow. I really like the finish, the wood grain and your quilting really pull the whole design together. Yvonne, I think the quilting design you chose compliments this quilt. It really turned out spectacular! Thank you for sharing and have a wonderful creative day! It took me forever to find the seam!! If you hadn’t said anything, I would have sworn you matched it…. 😀 Great job! I probably would have overly intensely quilted it and spent something like 8 hours on each stripe… Not always the best idea. The quilting here is understated, and lets the fabric shine! That was a quick finish. I didn’t see the seam, so clearly you did a great job. Kudos on a great finish! You are so fast! The quilting is wonderful for this quilt! This is such a great pattern too! What seam? It isn’t obvious at all! Great finish! What a great finish. 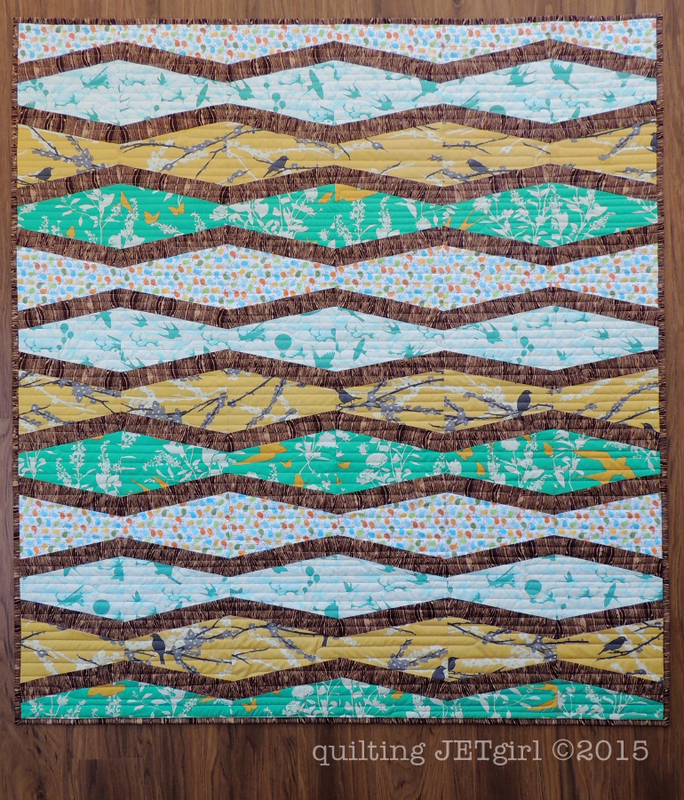 I love the quilting and the wood grain fabric frames both the quilt and each section. If you didn’t match the print on the back, it was darn close. I had to look very hard to see the seam–wouldn’t even have thought of it if you hadn’t mentioned it. A great finish. I love the touch of the woodgrain fabric to the design. BTW at ~8 hours you are living up to your subheading. I could find no seam in the backing! But I gave up after maybe 30 seconds. 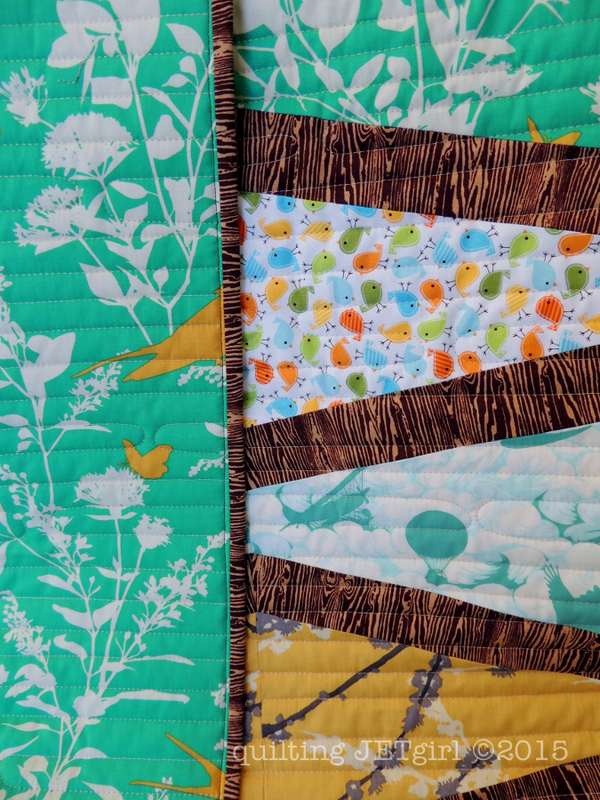 I like this variation of loose straight line quilting, it adds nice movement to all the flying things in the quilt! This quilt turned out beautifully! The wood grain binding and sashing are just perfect, and I really like the way the quilting is reminiscent of the wood grain texture but not in a blatant, literal way. You really are quilting at the speed of sound! Great finish Yvonne. It turned out great! I really like the whimsy you added with the fabric with the airplanes and hot air balloons. And the wood grain binding – what a neat touch! I love this quilt and I am the purchaser. Your work is so beautiful. This will be a lovely baby shower gift for Jenny and Sam. Thanks so much! I know you said you couldn’t match the seam, but I still can’t see it. A great finish! I definitely agree, each stage improved the end result, that binding in particular really makes a difference, and I also love the backing fabric, those swallows are great large scale.